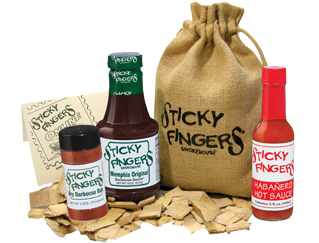 Flip Out Mama: Father's Day 2011: Sticky Fingers BBQ Sauce! We are kicking off our Father's Day Gift Guide here at Flip Out Mama, and I am super excited to introduce our first sponsor! Dads and Grilling go hand in hand, so I was super pumped when we received this wonderful gift pack from Sticky Fingers BBQ Sauce! I am not ashamed to say that I love getting my hubs stuff for the grill, because that means less cooking for me! And from the looks of the awesome Deluxe Sauce Pack, I won't be cooking anytime soon! 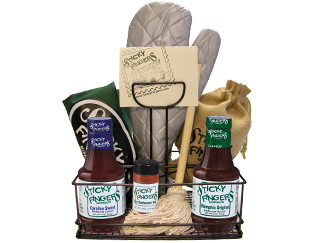 This gift pack includes five BIG bottles of Sticky Finger's famous BBQ Sauces. We were so excited to try them all! The sauces are: Memphis Original Sauce, Tennessee Whiskey Sauce, Carolina Classic Sauce, Carolina Sweet Sauce, and Habanero Hot BBQ Sauce. What do you do when you get a giant pack of BBQ sauce? Well, you make RIBS of course!!! I know this is totally going to blow your mind, but the first time I had ever tried Ribs was probably two years ago. I am now extremely addicted to them and force my family to eat them at least once a week! This was no exception, in fact we cooked extra so we could try all the sauces! Surprise, surprise, my favorite sauce was definitely the Tennessee Whiskey Sauce.. I will always be a whiskey girl, what can I say? It is a little sweet, but not too sweet, and the flavor is really rich and smoky. I used almost the whole bottle! Tater's favorite was the Carolina Sweet Sauce, he loves anything with honey in it! 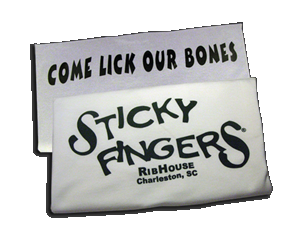 The Carolina Sweet Sauce is the key ingredient in the Carolina Sweet Ribs (The Most Popular Ribs at Sticky Fingers Restaurants!). And of course, The Hubs loved the Habanero Hot BBQ Sauce. It's really spicy, but really good! It's kind of like a cross between a hot sauce and a BBQ sauce, and we loved it! This is the Grilling Caddy Gift Set, it is like the ULTIMATE in grilling accessories! And look at that sauce mop! That thing is freaking awesome, I want one so bad! Another great option is this BBQ gift set, it includes the hickory wood chips that make food sooo yummy!! Oh, and look at this shirt I found! I want this for ME! I am so happy that I discovered Sticky Fingers, and hopefully someday I will be able to travel further south and visit one of their restaurants for myself! I would love, love, love to go to Charleston, and I will have to add them to my list of stops! I would like to say a big thanks to Beth Ann and all the wonderful folks at Sticky Fingers, they have been amazing, and they have definitely found a new fan in me! Okay, okay, just one more, I can't resist! 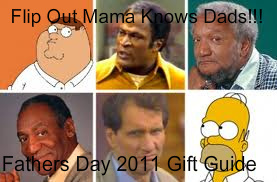 To get your dad any of these awesome gifts, just click here! disclosure: I received a sample product in order to conduct this review. Although a sample product was received, all opinions are my own and no monetary compensation was given. 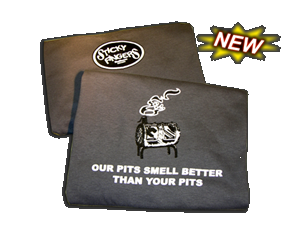 Now, please, go check out that pits tee shirt! I love BBQ and this stuff sounds delicious. New follower here. Feel free to stop by.